Next weekend (May 18 to 20) the southbound lane of 12th Avenue South will be closed at South Jackson Street in the Little Saigon neighborhood for First Hill Streetcar track construction. 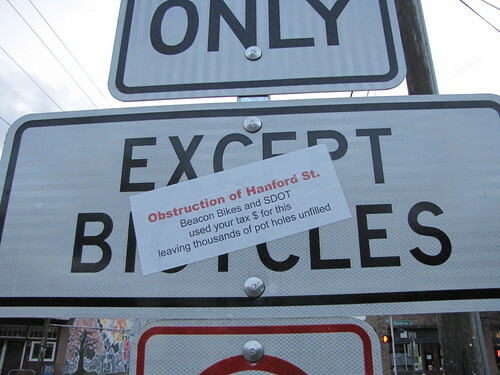 SDOT’s contractor will close the street from 7 a.m. on Saturday, May 18 until Monday morning. Southbound vehicles will be able to turn east or west onto South Jackson Street. For vehicles traveling to Beacon Hill, the detour will be eastbound on S Jackson Street to southbound Rainier Avenue South, and then westbound on South College Street. The detour will be signed to assist drivers traveling through this intersection. Local access, pedestrian access, and access to businesses will be maintained. Uniformed police officers will be on-site to keep traffic moving at the South Jackson Street and 12th Avenue South intersection. For further information, visit the project Website at www.seattlestreetcar.org. Barring rainy weather, the Seattle Department of Transportation (SDOT) is planning to work on South Spokane Street between 16th Avenue South and 19th Avenue South this Sunday, April 28. During the work, from about 5 a.m. to 5 p.m., the street will be restricted to a single lane in each direction. there will be a traffic officer on site to guide travelers through the busy intersection of South Spokane Street and Beacon Avenue South. 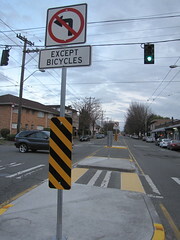 SDOT will restripe the roadway to install left turn lanes at the Beacon and Spokane intersection, to improve traffic efficiency as well as to allow for safety improvements and better connections for the neighborhood to Jefferson Park. In the future, SDOT and Seattle Parks will improve the intersection of Spokane Street and Lafayette Avenue South, adding a pedestrian crossing island, crosswalks, curb ramps, a stairway and a path to access Jefferson Park. These improvements are part of the Beacon Hill Neighborhood Greenway project to improve safety for pedestrians and bicyclists. You will need to detour around the the intersection of 12th Avenue South and South Jackson Street just north of Beacon Hill this weekend as construction for the First Hill Streetcar continues. The intersection at the heart of Little Saigon will be closed Saturday and Sunday, February 2 and 3, from 7 a.m. to 7 p.m. each day. Police and flaggers will be there to direct traffic and ensure that businesses and residences are accessible. The signed detour will direct Beacon Hill drivers south on 15th Ave. S. to a turn-around point on Corson Ave. S. From there motorists can access southbound I-5, or follow signs to West Seattle and 6th Ave. S. using northbound I-5. Residents living near I-5 may hear loud construction work, especially at night. Crews will shroud the work zone with noise-deadening shields, but if it’s too noisy, residents can pick up a free pair of earplugs at the Jefferson Community Center (3801 Beacon Ave. S.) or call the project’s 24-hour construction noise hotline at (206) 440-4DOT (4368).